We believe that progresses in technology need to be embraced, especially in our own dental practice. Each of our treatment rooms is equipped with flat screen TV's which allow our patients to view X-rays and images of their teeth. They can also watch movies--we've noticed this helps a lot of patients with relaxation. Any dental practice worth their salt isn't complete without state of the art equipment. Laser and CAD technology makes dentistry a breeze! Our office utilizes the best tech to make procedures safer and recovery times shorter. We even have a 3d ctscan machine that can help us identify issues of the neuromuscular system. 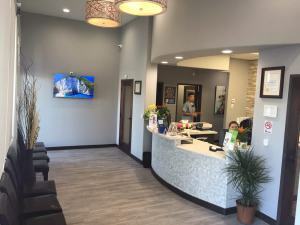 With years of experience and constant improvements coming into our office, we maintain a high standard of care at our dentistry. Our office is fluent in Spanish. Se Habla Español. We have an excellent staff ready to make visiting our dentistry quick, and easy. Our staff is composed of the best managers, hygienists, and insurance coordinators around. We put them through the ringer and they really know their stuff! You can count on them to help you: find a flexible appointment that works for you, make dealing with your insurance company hassle-free, and teach you about what our customized care plan will entail. Our office wouldn't be as great as it is today without the help of our incredible staff!